Makeblock is excited to present the newest member of the Makeblock Neuron family: The Explorer Kit. Exclusively sold at Apple Stores around the world, the Explorer Kit, as an educational toy, offers a range of new features for beginner code learners including new blocks and coding robot cases, plus interactive lessons and support for Swift Playgrounds on iPad. We believe kids using the Explorer Kit is the ideal way to start with programming. The Neuron Artist Kit includes 8 electronic blocks (sound sensor, led panel, ranging sensor and more) and 6 cardboard templates. With these materials, children can easily create a number of fun creations, like a ukulele, a xylophone, a cloud lantern, an infinity band, an LED sword and a magical drum. Children can learn coding while getting an exciting, engaging and interactive experience. The cardboard models can also be purchased separately in order to fit your educational requirements. 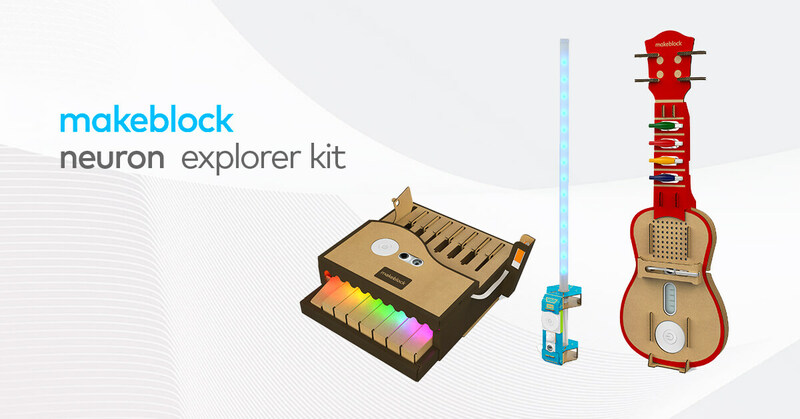 The Explorer Kit comes with a total of 12 coding blocks including Temperature Sensor, Ranging Sensor, Light Sensor, LED Strip Driver and LED Strip, Dual DC Motor Driver and DC Motor blocks. To help you start with your new educational toy, we have included four cardboard templates to build inventions including a piano, ukulele, a car, and an LED sword. New in the Explorer Kit is support for Apple’s Swift Playgrounds app for iPad with which learners can start programming in Swift, and subscribe to the Neuron Playground for over 30 coding lessons that combine physical and digital construction. Swift is a powerful and intuitive programming language created by Apple for creating software for macOS, iOS, and more. With Swift Playgrounds, a revolutionary iPad app that helps users learn and explore coding in Swift, children and students can easily explore the language used to create world-class apps for the App Store. Engaging lessons and challenges help students learn the core concepts of coding by writing real Swift and iOS code in an interactive environment designed for touch. The Neuron Artist Kit comes complete with the Neuron app and mBlock programming software. The Neuron app supports flow-based programming language so children can just drag blocks, tap icons and link nodes. Children can see the results of their code in the real world and quickly refine the code. With mBlock, a software based on Scratch 3.0, children can develop advanced skills. Since mBlock supports block-based programming language, children can easily program Neuron to create stories, games, and animations that are engaging. 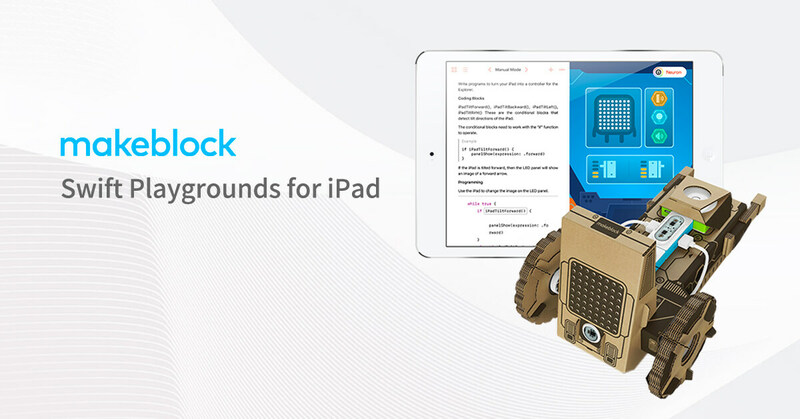 When Makeblock Neuron is connected to your iPad over Bluetooth, the Swift Playgrounds app provides an engaging user experience that mirrors on screen what your invention does in the real world. Build the Explorer Car and see the motors spin within the app alongside your vehicle once you run your program. The Makeblock Neuron Explorer Kit is an ideal educational toy that gives children a way to get to know programming and related STEM subjects by building toys and games. By doing so, the Explorer Kit greatly lowers the threshold for creation, making inventing gadgets something everyone can do. 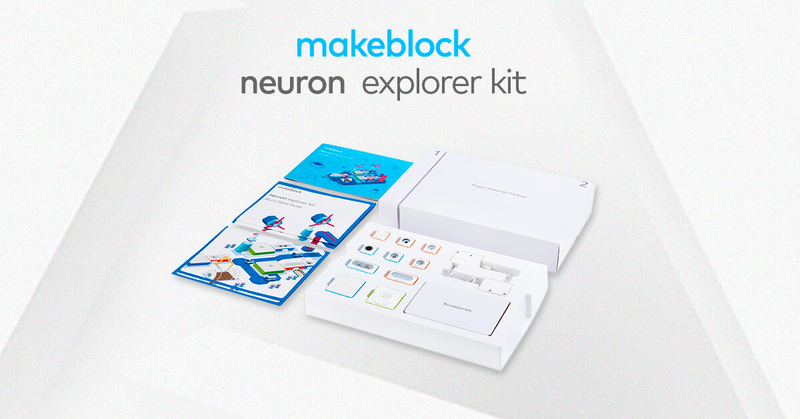 The Makeblock Neuron Explorer Kit is available exclusively from Apple Stores worldwide and at Apple Online Store.